Spring in Central Texas celebrates the reawakening of life with bluebonnets and red Indian paint brushes bathing the rocky hills and pastures with bright color. Life is light hearted and carefree. 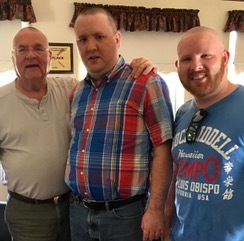 It was a deceptive beauty last year: On the second day of Spring, my adult special-needs cousin Peter received a diagnosis of testicular cancer. It was a bombshell. The lightness of Spring disappeared, and the rocks under the wildflowers revealed themselves hard and unforgiving. The tumor was large, but had not yet spread to his lymph nodes or lungs. Peter’s surgery was successful, and his family rested in their strong faith and supportive network of loved ones. Peter returned to his job training program at a nearby hospital, where he completed the work and began a new life as an intern. Unfortunately, the first post-surgical scans revealed the seeds of the cancer had metastasized to both lungs, and he was re-diagnosed with stage three cancer with multiple tumors. Peter had to begin chemotherapy immediately. Who knew what Peter understood about what he was going through? He speaks with gestures and facial expressions, rather than words. The medical staff at the infusion center was understandably a bit apprehensive about how he would cope. None of us knew what to expect. The family again took comfort in their faith and lived in what my aunt calls ‘divine peace’ throughout the five-months of treatment and recovery. We were determined to make this a journey of gratitude, in both good times and dark. 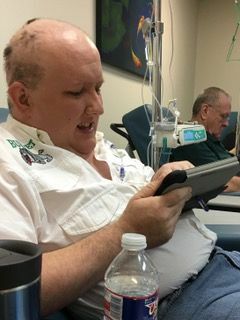 Chemo for testicular cancer is a very rigorous regimen with very little down time between treatments. Side effects include hair loss, fatigue, nausea and vomiting. Thankfully, Peter understood the importance of cooperating and did so with incredible poise and maturity. To his caregivers, he was a model patient. At home, even when he felt terrible, exhausted and couldn’t tolerate much food, he carried a sincere faint smile. Though all of us were emotionally and physically exhausted, the family felt overshadowing love and divine presence every day. Peter’s prognosis is now excellent. Testicular cancer responds very well to treatment. The lung lesions are gone, and we have every expectation of him remaining cancer free. It’s strange that such a bright early Texas spring led my family through such a bleak summer and fall, but the dark winter promises a long future for Peter. Through it all, his inner light sustained us – and we came away thankful for this miracle called life. To celebrate Peter and support others on this journey, BoxBar donated 10% of our proceeds from Stache Bash to the Movember Foundation.